Located midway between San Antonio and Houston, the three counties of Lavaca, Fayette, and Colorado have never had any settlement large enough to call a city. No town in these rural counties ever attracted more than a few thousand people, many of whom were of German or Czech descent. Nevertheless, a small number of Jews were scattered among such towns as Hallettsville, Schulenburg, Columbus, and La Grange, and came together to establish a Jewish community that served the tri-county area. La Grange, the seat of Fayette County, was the first to attract a significant Jewish presence. Seelig Alexander left Prussia in 1849. After a short time in New York City, Alexander moved to La Grange with his wife Bettie in 1851. After serving as a captain in the Confederate Army, Alexander returned to La Grange and opened a successful dry goods store. By 1870, he owned $5000 in real estate and $4000 in personal estate. By 1860, a number of Jews lived in La Grange, most all of whom, like Alexander, were Prussian-born and involved in retail trade. Sam Alexander owned a grocery store while Julius Cohen was a peddler. 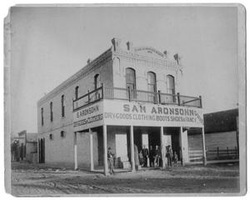 Bernard Zander moved to La Grange in 1859, and opened a saddlery store that remained in business for several decades. Gabriel Friedberger owned a dry good store on La Grange’s downtown square in the 1850s; he was also involved in the cotton trade and even smuggled the cash crop to the Union during the Civil War. By 1868, La Grange Jews had founded a Hebrew Benevolent Society, which purchased land for a Jewish cemetery after two Jewish children died in late 1867. Gabriel Friedberger was its first president. Later, the cemetery came under the control of the women in the community, who formed the Ladies Hebrew Cemetery Association. Although the La Grange Jewish cemetery was never large, containing only 32 marked graves, it was the first effort of Jews in the tri-county area to organize. A decade later, Jews in Columbus, the seat of Colorado County, established a Jewish cemetery in 1879. The following year, Jews in Hallettsville did the same. In 1879, journalist Charles Wessolowsky visited Columbus and reported that the town had “twelve Jewish families and a number of young men.” Soon after, a B’nai B’rith lodge was established, which attracted members from other towns in the area, including Hallettsville. By 1880, Jews in Columbus had begun to meet together informally for prayer. Later, the Steiner family gave the group a Torah, which has been used by the Tri-County Jewish community ever since. Halletsville boasted a modest Jewish community as well. Jews like Michael Levey came from Alsace Lorraine and settled in Hallettsville in 1860. After serving in the Confederate army during the Civil War, Levey opened a grocery business in Hallettsville. Abraham Schwartz and his mother Henrietta Schwartz came from Bavaria in 1859. He ran a mule wagon delivering freight service from Hallettsville to Schulenburg, the site of the nearest railroad. Starting in 1870, he owned and operated a general store and saloon. He and his wife Babette had four daughters and one son. His son Marcus started a family law practice in Hallettsville in 1895 that continues to the present under the name of Schwartz & Schwartz. 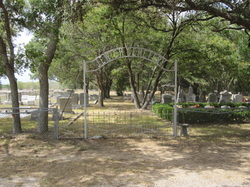 Jews in Hallettsville established a Chevra Kadisha (burial society) in 1890, which maintained the Jewish cemetery and gave out charity to Jews in need. By 1900, its 15 members held services on the High Holidays, often at the home of Isaac Samusch. In 1904, the Jews of these various towns decided to establish a formal congregation. To raise money for the fledgling group, members decided to auction off the naming rights for the congregation. Coleman Asher, a 70-year old widower who owned a grocery store in Hallettsville, made the winning bid and named the congregation “Beth Asher,” after himself. Beth Asher met in a rented room on Texana Street in Hallettsville, using the Torah that had been used by the group in Columbus. In 1907, the congregation had 20 members and held services on Friday nights and major holidays. A. Meyerhoff was its president. Albert Saft, a German-born bookstore owner, usually led the services, which used both Hebrew and English prayers. Beth Asher had a religious school with ten students in 1907. In 1905, Jewish women founded a Hebrew Ladies Aid Society. By 1907 it had 25 members; Bessie Landa was its president. Most all of the members of Beth Asher owned retail businesses. Indeed, by 1890, Jewish merchants dominated the downtown streets of Hallettsville, Columbus, and Schulenburg. That year in Hallettsville, Samuel Aronsohn and Louis Reichman owned dry goods stores, while Moritz Cohen owned a stove and tinware business. Abraham Levytansky’s store sold jewelry and musical instruments while Isaac Samusch sold groceries. Jewish women owned two businesses in Hallettsville in 1890-- Fannie Schwartz owned a combination hat and grocery store, while Rosalie Schwartz had a general store. In Schulenburg, Hyman Goldstein, Max Green, and Michael Levey owned general stores while Max Kalisky and Amelia Schwartz had grocery stores in 1890. In 1887, brothers Max and Julius Schwartz opened a mule and horse barn in Schulenburg. They became one of the largest dealers in horses and mules in the southwest, and remained in business for 52 years. Both Schwartz brothers were very involved civically in Schulenburg. Max Schwartz served on the city council for many years and was a deputy sheriff. Julius Schwartz was president and longtime board member of the First National Bank of Schulenburg. Michael Levey, who moved to Schulenburg from Hallettsville in 1880, quickly got involved in local politics, serving three terms as mayor of Schulenburg, from 1883 to 1889. Isaac Rosenthal owned a mercantile store in La Grange and served as a city alderman from 1880 until his death in 1906. This civic involvement continued into the 20th century. Hirsh Schwartz, Julius’ son, was a lawyer and banker who became one of Schulenburg’s most prominent citizens. He served as president or vice president of the local chamber of commerce for twelve years, receiving their Outstanding Citizenship Award in 1955. Schwartz was also president of the First National Bank and helped found a local industrial foundation that sought to bring industry to Schulenburg. Schwartz capped off his long civic career by serving as mayor of Schulenburg from 1964 until his death in 1981. Not much is known about the 40-year history of the Beth Asher congregation. For many years, the group met in a rented room on the ground floor of the Odd Fellow’s Hall in Hallettsville. While most services were lay-led, occasionally the congregation would bring in a visiting rabbi; usually, the visiting clergy would stay at Fink’s Hotel, owned by congregant Abraham Finklestein. Around 1932, Susan Steiner, Irene Waldvogel, and Clara Klein created a new Sunday school for the congregation. The classes, taught by these three women, were initially held at the Steiner home. As the school grew, additional classes met at other homes. In 1938, Beth Asher celebrated its first confirmation class in a ceremony at the Odd Fellow’s Hall led by Rabbi Robert Kahn of Houston’s Congregation Beth Israel. Beth Asher would hold a confirmation ceremony every other year for the next decade or so, often led by Rabbi Kahn. The confirmation service, along with the involvement of a Reform rabbi, shows that Beth Asher had moved away from its more traditional roots. The women of the congregation established a chapter of the Council of Jewish Women in 1936, which functioned as the Sisterhood for Beth Asher. Clara Stahl was the group’s first president. By 1960, the CJW chapter had 37 members in seven different towns. The group did a lot of charity work, supporting the congregation, national Jewish causes, and the larger community of the region. They also held an annual community seder at Passover. In 1945, the Jews of the Tri-County area decided to reorganize the congregation with a new name and constitution. They modeled their new bylaws and constitution on that of the Reform congregation Emanu-El in Houston. 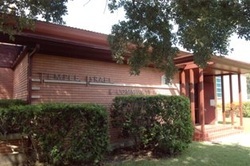 The members chose the name Temple Israel. Temple Israel’s first meeting was held in Hallettsville, though the congregation had members in such towns as Columbus, Schulenburg, Edna, Cuero, La Grange, Weimar, and Flatonia. In December 1946, the congregation began to discuss building the first synagogue in the tri-county area. The Odd Fellows Lodge in Hallettsville, in whose hall the congregation had been meeting, decided to move, further prompting Temple Israel to build a home of their own. The first question was where to build it as the members of Temple Israel were scattered in eight different towns. Congregation members voted overwhelmingly to build the synagogue in Schulenburg, since it was the geographic center of the region. Hirsh Schwartz was president of the congregation at the time, and donated land in Schulenburg for the new temple. Schwartz also led the fundraising effort, which collected money from local Gentiles as well as Jews in other cities. In 1951, Temple Israel dedicated its first synagogue on Baumgarten Street in Schulenburg, using the same Torah that had belonged to Beth Asher in Hallettsville. Clergy from three different Houston congregations participated in the event. 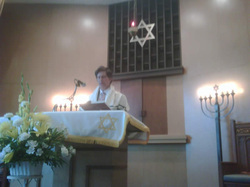 Rabbi Kahn of Temple Emanu-El led the dedication service and gave the keynote address, Cantor George Wagner of Beth Yeshurun sang, and Rabbi Robert Schur of Beth Israel gave the closing prayer. Oscar Brown, the mayor of Schulenburg, took part in the ceremony, as did the pastor of the First Baptist Church. The congregation was now Reform, using an organ during services and bringing down student rabbis from Hebrew Union College for the High Holidays. Rabbi Kahn of Houston would come in to lead confirmation services and the occasional bar mitzvah. 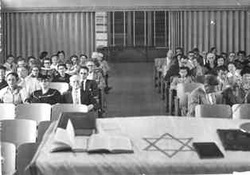 By 1962, Temple Israel had joined the Reform Union of American Hebrew Congregations. The congregation was small, numbering only 37 members in 1962. Services were only held one Friday night a month and on the High Holidays. Eli Rubin served as lay leader for the monthly services. In 1960, there were only eight children in the religious school. 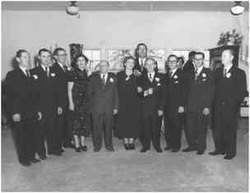 As in the early years, most members of Temple Israel remained in the retail business through the mid-20th century. The Klein family made their mark throughout the Tri-County area. Louis Klein moved to La Grange in 1923 from Austin, opening a dry goods store. His son Larry later took over the business, running it for several decades. Four of his other sons opened stores in other small towns in the area. Myke Klein had a store in Schulenburg, Charles Klein opened one in Columbus, Sid Klein owned a store in Smithville, while Moe Klein had one in Flatonia. The Klein family was very active in the larger community. Louis Klein served on the La Grange city council while his son Charles was a founder and president of the Columbus Chamber of Commerce and was named the town’s “Citizen of the Year” in 1989. Polish-born Ike Lippman opened a dry goods store in Schulenburg in 1912. His son Leslie soon joined the business, which was called Ike Lippman & Sons Dry Goods. After Ike’s death, Leslie ran the store until he closed it and retired in 1988. Leslie also owned a farm, raising cotton and cattle for many years. George Lauterstein built La Grange’s finest department store. He also owned a lower-end retail outlet called the Bargain Center. Lauterstein became a leader of the La Grange business community, serving as a director of the First National Bank of La Grange for 54 years. Lauterstein’s Department Store was bought out by the Gindler family in 1968. Although most Jews in the area remained in business, a few had entered the professions. Norman Rubin was an optometrist, while the Schwartz family has had three generations of lawyers in Hallettsville. Marcus Schwartz opened a law practice in Hallettsville in 1895; he also served on the town's first school board and helped found a local bank. His son, Armond Schwartz, served as Lavaca County Attorney for many years, and spent almost 50 years as the City Attorney for Hallettsville. Armond's son, Marcus Schwartz, continues to practice law in Hallettsville, leading the firm that had been founded by his grandfather in 1895. The Jewish communities in the Tri-County area were never large. In 1937, 22 Jews lived in Columbus, 30 in Hallettsville, 23 in La Grange, and 24 in Schulenburg. Temple Israel, which had a peak membership of 37 families in 1962, soon went into steep decline The religious school, which had been run by the women of the congregation, closed by the early 1970s as there weren’t enough Jewish children to sustain it. The remaining Jewish children in the Tri-County area usually went to Houston for religion instruction. By 1976, the congregation was down to 23 families as many of the Jewish children raised in the area had moved away to larger cities. By 1995, the congregation only had 9 families.